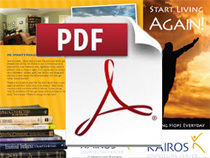 Why Choose Kairos Counseling Center? left unattended will ony get worse. See how Kairos can help. Let’s be honest. Life is hard at times. You and your family are stressed with all that life throws at you. Communication is strained with your husband, wife, significant other, teens or children, with no hope in sight. Now, maybe add the dynamics of depression, anxiety, grief, loss, alcohol and drugs and you have a toxic recipe that left unattended, will only get worse. Sound familiar? There’s a lot of pain in your life. You don’t know how to process it all and don’t know what to do about it. Many times, you and others you know suffer in silence. Unless you get help, the problems will only get worse and sometimes can be lethal. You’re stuck. Where do you go for real help? WELCOME TO KAIROS COUNSELING CENTER. Kairos Counseling Center believes in helping people on their journey to discovering the truth about themselves to be the very best that they can be. ©All materials and content copyrighted.